NEW ORLEANS, Louisiana, July 15, 2010 (AFP) - British energy giant BP says it has temporarily stopped oil flowing into the Gulf of Mexico for the first time in three months as it began key tests hoping to stem the spill for good. Shortly after BP engineers shut down the last of three valves on a giant new cap placed on the blown-out well at around 2:25 pm (1925 GMT) Thursday, senior vice president Kent Wells announced no oil was leaking into the sea. AFP/BP -- This still image from a live BP video feed shows apparently no oil leaking in the Gulf of Mexico. "I'm very excited to see no oil flowing into the Gulf of Mexico," Wells told reporters, but cautioned it was only the start of a painstaking testing process set to last 48 hours to analyze the condition of the underground wellbore. The announcement was the first sign of real hope for desperate coastal residents who have had their livelihoods ravaged by the worst environmental disaster in US history, now in its 13th week. Teeming fishing grounds have been closed and tourists have been scared away -- two vital economic lifelines for the southern region still struggling to recover from the 2005 Hurricane Katrina. Endangered wildlife has also been increasingly threatened by huge ribbons of oil fouling the shores of five states -- Texas, Louisiana, Mississippi, Alabama and Florida. The costly, massive clean-up is likely to last years. US President Barack Obama, whose administration has led pressure on BP to stop the oil flow, welcomed the news of the capped well as "a positive sign," but cautioned: "We're still in the testing phase." He said he would address the issue again Friday. BP's chief operating officer Doug Suttles also warned it was not yet time to celebrate, saying more time was needed as the tests are completed. "I think it's an encouraging sign. In a couple of more days it may even be more encouraging, but no celebrations," Suttles told reporters. "If you go talk to these people that live here, celebration is the wrong word." 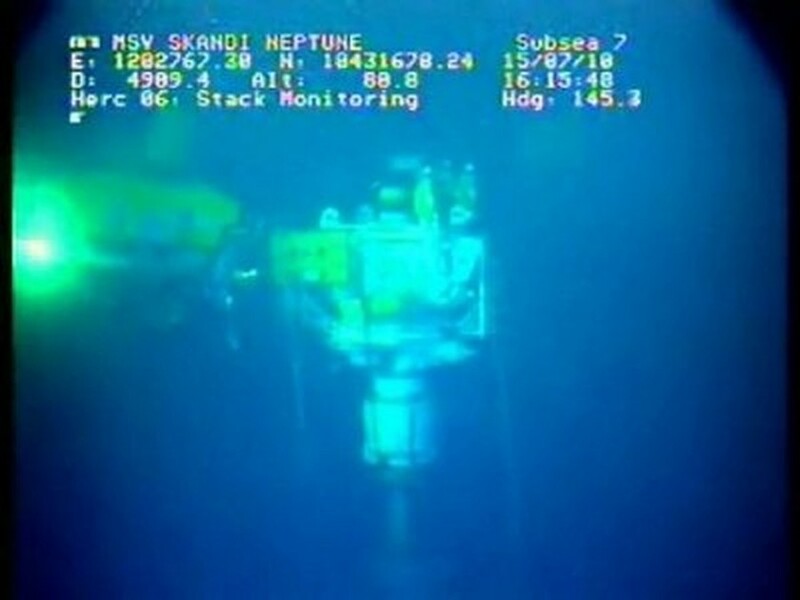 The tests are intended to determine whether the wellbore, which stretches 2.5 miles (four kilometers) below the seabed, was damaged during an April 20 explosion on the BP-leased Deepwater Horizon rig, which sank two days later. BP is hoping to choke off the oil flow from the well, estimated at between 35,000 to 60,000 barrels a day. But doing so from the top could force oil out in new leaks if the wellbore was damaged. During the test, engineers will take multiple readings from the 30-foot (nine-meter) capping stack placed on top of the wellhead on Monday to monitor the pressure inside. High pressure readings would allow the three valves to remain shut and the well would effectively be sealed, but low readings could mean there is a hole somewhere in the casing of the well where oil is escaping. After 48 hours, the engineers will open up the system again and begin capturing the oil through two surface vessels to allow a new seismic survey to be carried out, said the official in charge of the US response, Coast Guard Admiral Thad Allen. A final solution to the leak is not expected before mid-August, when crews will complete the first of two relief wells, allowing the oil reservoir to be permanently plugged in a "kill" operation. The Gulf disaster has so far cost BP some 3.5 billion dollars (2.78 billion euros) and compensation claims from devastated residents of the region could reach 10 times that. Local officials who have seen their coasts sullied by the oil were cautious but hopeful. Louisiana Senator Mary Landrieu described the stoppage as "the first piece of good news the Gulf Coast has received in three months." Still "it is too early to declare victory and there is still a lot more work that needs to be done. The next 48 hours will be critical as they test the pressure of the well and ensure the cap is working properly," Louisiana Governor Bobby Jindal cautioned. "We have been fighting a war against this oil for months now and we know our battles don't end even when the well is capped. Millions of gallons of oil are still in the Gulf and some estimates show that oil will continue to hit our shores for many more months or maybe even longer." Meanwhile the Financial Times reported Friday that BP is speeding up the sale of up to 20 billion dollars (15.5 billion euros) of assets in a bid to boost funds after the Gulf oil spill. BP is seeking to build up a disaster fund of 20 billion dollars to cover the clean-up costs for the disastrous oil spill.